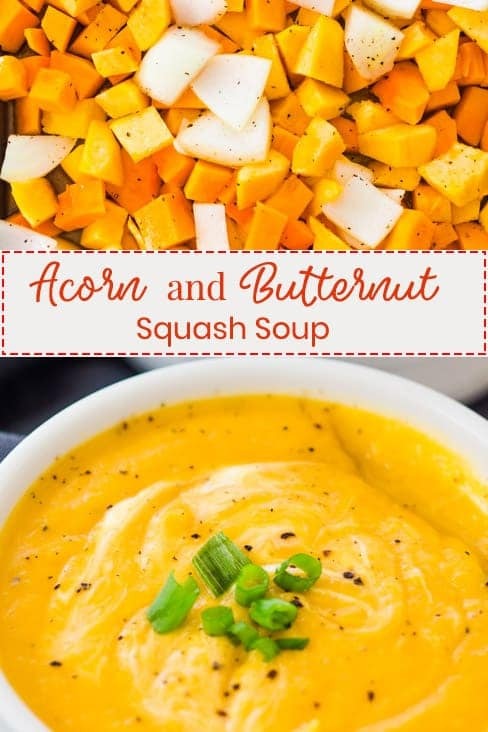 Acorn and Butternut Squash Soup only requires a few ingredients to make and is incredible! 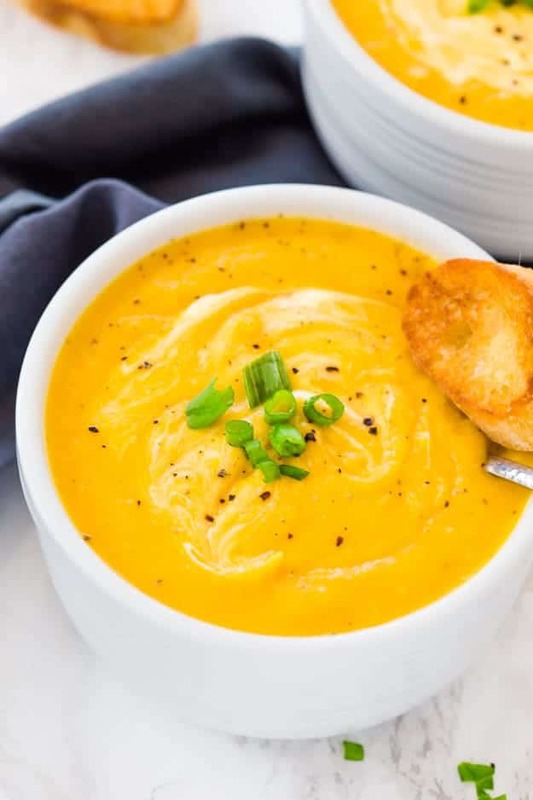 The perfect easy, healthy soup to make in the Fall! One of my favorite eating seasons is Fall. I cannot get enough of soups, stews, and braises. 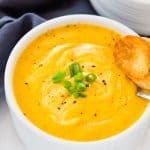 I want all of them and every single day, especially a flavorful soup like with acorn and butternut squash soup! And then Thanksgiving comes, but that’s a whole other topic we can sit here and chat forever about; soon, okay? 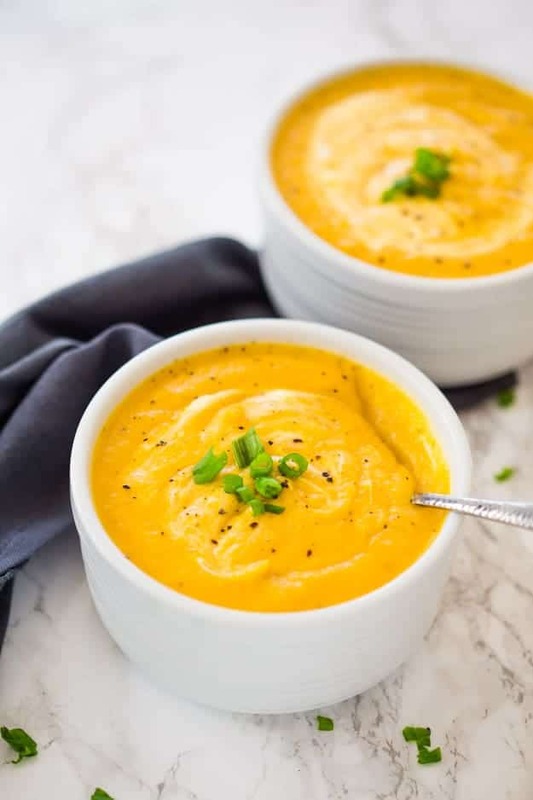 All of your winter squashes are in season right now, so I knew it would be the best time to make another batch of this acorn and butternut squash soup. And it didn’t disappoint! A few years back, 2015, I posted this recipe, but it needed a face life on some of the photos, and I am so glad it did. There are a few things I did change with the recipe to make it even better. It now has a little kick of heat to offset the sweetness from the acorn and butternut squash. Not much, though, but just enough to balance the flavors a little more. For roasting vegetables, especially winter squash, you will want uniformized sized pieces. I tried to keep the vegetables simple and wanted the winter squash to shine in this soup, so I only added a large onion and sliced it into large pieces. You will want to season liberally with freshly cracked black pepper and salt, then drizzle oil all over and mix everything. Since we are roasting at a high temperature, you will need a high smoke point oil like avocado oil or coconut oil. You will then need to add your baking sheet to the oven and bake at 425 degrees F for 35-40 minutes, or until your squash is fork tender. 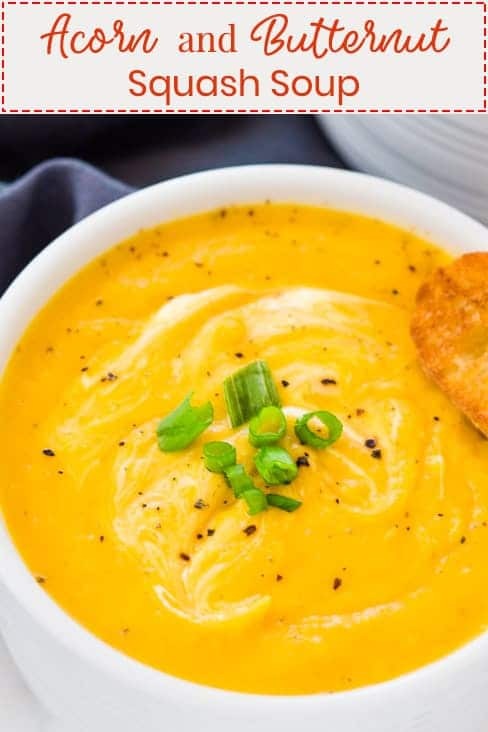 It’s so easy to freeze leftover soups! I like to wait for the squash soup to come to room temperature, place the mixture into a plastic container with a lid and freeze them until solid. Once they are solid, I pop them out of the plastic container and put them into a gallon-sized ziplock bag. If you wanted the soup to last for a while in the freezer place them into a food saver bag and vacuum seal them, this is my favorite food saver I use all of the time. To defrost your soup take it out of the freezer and place it into the refrigerator the night before, heat it on the stovetop and you are good to go. I tend to keep my sides a little simple with this soup, so sauteed spinach would be fantastic, a simple fall salad would be delicious, or even a few pieces of buttered bread is fantastic. Preheat oven to 425 degrees F. Grease a large baking sheet and place the diced acorn and butternut squash on the baking sheet. Drizzle oil on top and season with salt and pepper, mix until combined. 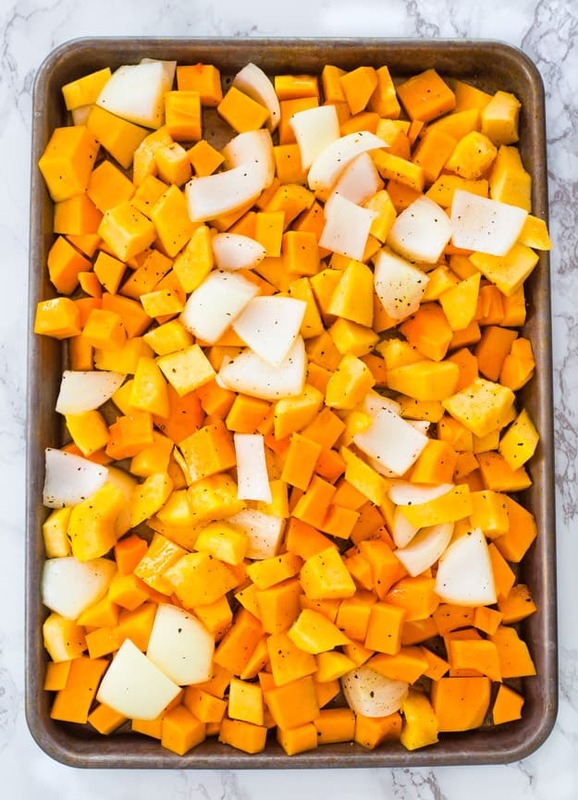 Place the baking sheet in the oven and bake for 35-40 minutes, or until the squash is fork tender. Add the roasted vegetables to a large pot, add in the vegetable stock, minced garlic, dried thyme, smoked paprika, and cayenne pepper. Mix everything and allow the soup to simmer over medium heat for 20 minutes. Remove from heat. Puree the soup using an immersion blender. Taste and season with salt and pepper, if needed. The nutrition information does not include the garnishes or salt for seasoning. Thanks for the recipe! I do love the taste of butternut squash, but it can be a little difficult to deal with. 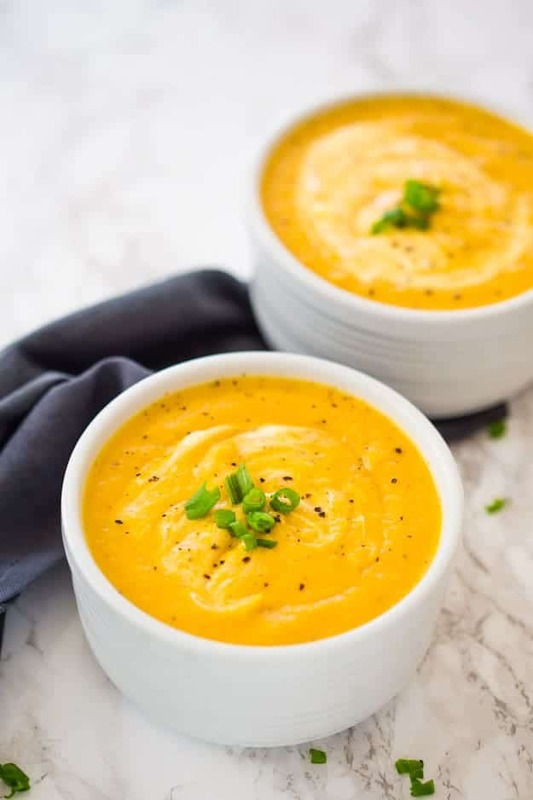 We recently invested in an immersion blender, and I agree, it makes a world of difference in making these soups easier. Oh it does, Doug! You are more than welcome. Curious to know if you have the nutrition information on this recipe. Thanks in advance!! Hi, Erin! I do not calculate nutrition information on my recipe because everyone uses different brands. There are many free calculators you can use online to calculate it.